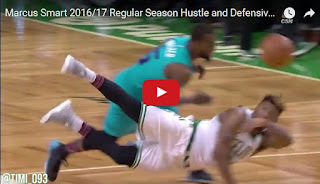 Watch how Marcus Smart did on both ends of the floor in his third season as a member of Boston Celtics. Smart became the "sixth starter" on this team and played best basketball of his life, averaging career-highs in points (10.6), assists (4.6) and steals (1.6). He was doing it all on defensive end of the floor, including a numerous of hustle and game-winning plays. Smart still needs to work on his shot but he's been great as a playmaker and in the post, scoring at will against smaller guards. Let's hope he can continue this progress in umpcoming season in which he'll play for a new, big contract.